And that’s not the only dubious use of statistics the president made during his economic speech in Cleveland on June 14. The president also said he “approved fewer regulations in the first three years of my presidency than my Republican predecessor did in his.” Obama is referring to the number of final rules reviewed by the White House and issued by executive agencies, but the Obama administration has approved far more “major” regulations, which are those that “may result in expenditures of more than $100 million,” according to the White House’s Office of Information and Regulatory Affairs. The president’s typical stump speech makes reference to private-sector job growth during the last two years or so. 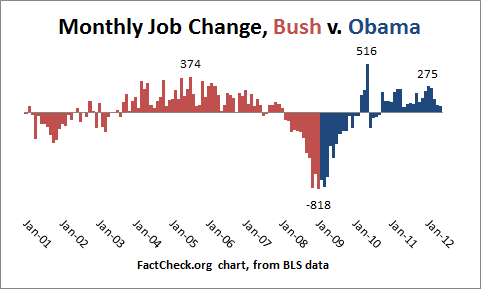 But this time he added a twist when he compared job growth over the last 27 months with Bush’s first seven years. Obama, June 14: Our businesses have gone back to basics and created over 4 million jobs in the last 27 months — (applause) — more private sector jobs than were created during the entire seven years before this crisis — in a little over two years. Obama is referring to the increase in private-sector jobs from February 2010 to May 2012. He uses February 2010 as the starting point, because that was the low point for private employment at 106,773,000 jobs. It’s been going up ever since. Right now, it’s at 111,040,000 — an increase of 4,267,000 jobs, according to the Bureau of Labor Statistics. So, the president is correct about the number of jobs created in the last 27 months. But then he uses an economic sleight of hand when he compares his best 27-month period with the first seven years of President Bush, ignoring the fact that Bush inherited an economy on the brink of a recession. Soon after Bush took office, the U.S. economy officially fell into a recession — which lasted from March 2001 to November 2001, as measured by the National Bureau of Economic Research. There is always a lag in job growth after a recession officially ends, and the low point for private-sector employment was not reached until July 2003, when it fell to 108,232,000. By October 2005, which would be 27 months after the job slump ended, the U.S. had 112,491,000 jobs — an increase of 4,259,000 jobs. 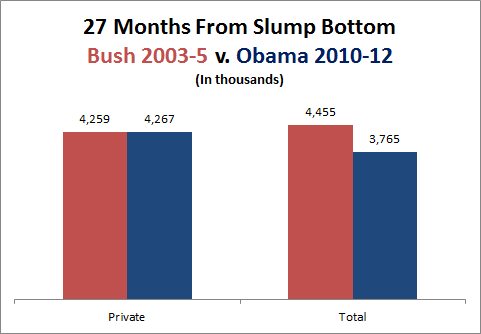 That’s nearly identical to Obama’s best 27 months after the recession, as you can see from the chart below. You’ll notice, too, that the chart above shows Bush had more total jobs — which includes not only private-sector jobs, but all government jobs. By using private-sector jobs, the president makes his job-creation record look better. The U.S. has gained about 55,000 private-sector jobs since Obama became president in January 2009, but overall there has been a total job loss of 552,000 — all because of the decline in government jobs. Just for the record — and to show how easily one side or another can shade the truth by clever selection of the time period it wants to discuss — here’s the monthly change in total jobs (total nonfarm employment, seasonally adjusted) for the full Bush presidency, and Obama’s term so far. Obama’s best month was May 2010, but that’s due primarily to an artificial spike in temporary hiring by the Census Bureau to conduct the 2010 Census (427,000 federal jobs were added that month alone, of the 516,000 total jobs). That gain was erased in the months following, once the door-to-door Census canvass was completed. Aside from the Census spike, Obama’s best month was January of this year, with a 275,000 job gain. That didn’t equal Bush’s best month, and it’s been downhill since then. Our point here is that Obama’s jobs record can be made to look better or worse, depending on what’s being counted, and when. That’s true, but only in a literal sense. Obama is referring to the number of final rules reviewed by the White House and issued by executive agencies. Officials at the White House’s Office of Information and Regulatory Affairs walked us through the data, and the tally comes to 931 in the first three years under George W. Bush compared with 886 in the first three years under Obama. But that includes many rules that have relatively small economic impact. Every year, OIRA puts out an annual report on the “major” federal regulations enacted each year. Major rules are those that “may result in expenditures of more than $100 million.” That includes rules that may have a cost or benefit of more than $100 million. By that measure, the Obama administration has approved far more than Bush did in his first three years in office. According to OIRA’s report, Obama approved 37 “major” regulations between Jan. 20, 2009, (when Obama was sworn into office) and Sept. 30, 2011 (see D-3), including 29 that cost more than $100 million. During a similar span at the start of the Bush administration, Bush had approved nine (see D-2) — six of which cost more than $100 million. The estimated cost of Obama’s major regulations also far outweighed the cost of major regulations approved by Bush, $18.8 billion to $4.3 billion. There are also benefits to many regulations, things like savings on gas due to new fuel efficiency standards or health care savings due to decreased incidents of illness from pollution regulations. OIRA puts a value on those benefits as well. According to OIRA estimates (Figure 2-1), the benefits of Obama’s regulations far outweigh the costs, and the net benefits far surpass the net benefits from Bush’s regulations. From the start of Obama’s presidency to Sept. 30, 2011, the net benefit of Obama’s regulations was estimated at $91 billion. As Cass Sunstein, OIRA administrator, noted in a speech on May 12, that’s over 25 times more than the net benefit ($3.4 billion) during a similar time period at the start of Bush’s presidency.